I received an email from HB of Indonesia on 9 October 2009. Later, HB wrote another email in response to my questions. These two emailed are merged and edited mildly for clarity and easy reading. I have tried to retain the original writing as much as possible. Thank you very much for your newsletter. It is very important to build up my spirit. Regarding chemotherapy and radiotherapy it is very hard to know the truth. I was diagnosed with mucoepidermoidcarcinoma. (Note: This is the most common type of cancer of the salivary or parotid gland). The treatment I would undergo were surgery and radiation, at least thirty times. I underwent a major operation – radical neck resection, in November 2008. The cancer was at the base of my tongue but it had already spread to the lymph nodes. All these were removed. The doctor said it was already a stage four cancer. One month after the operation, I went to the Singapore General Hospital (SGH) for routine check up. I told my doctors that my shoulder, wound, both ankles and the right side of my jaw were very painful. All the three doctors that I met at SGH said: You should go for radiation first, and then come back here for check up. We asked if I were to undergo radiation, what would be the percentage that the cancer would come back, or if I did not take radiation what would be the percentage that it will come back again? The doctor answered: Seventy percent chance that the cancer will come back without radiation, and fifty percent chance if I take radiation. In my mind there is only a difference of twenty percent. It is not significant enough considering the side effects from radiation that I have to suffer. So we decided not to take radiation and came back to Jakarta. But I felt very scared. My spirit was very upsetting. I felt very bad. I felt scared to undergo the radiation and at the same I felt scared not to undergo radiation. In Jakarta I went to consult with four doctors and all of them claimed that my cancer had already spread to my jaw, kidney and bone (ankle). Under this situation, they said I should undergo radiation and / or chemotherapy, if not, my life will worsen and it would be dangerous to my health. I felt sad and hopeless. I thought my life could only be counted by the days. I prayed to Jesus and asked: Do I really need this radiation, or not. My life was going to end and my condition was still weak, tired and it was difficult to swallow any food. In this desperate situation my family and I always prayed. My friends also prayed for me. We pray for a “miracle”. 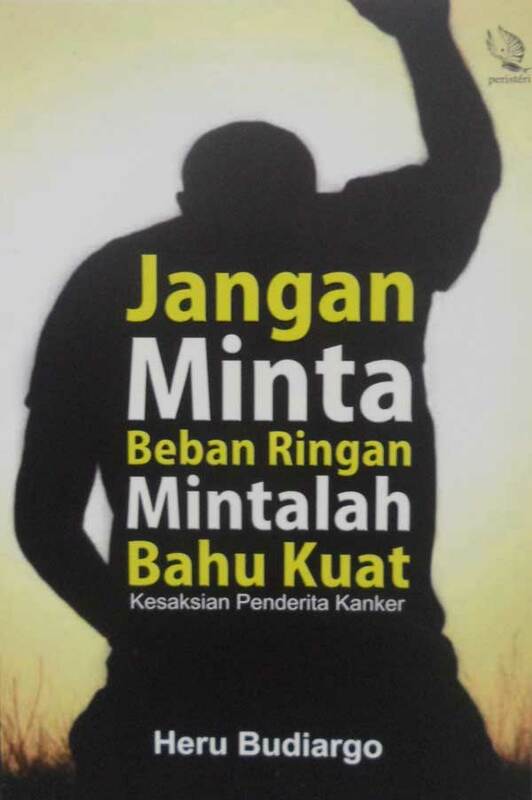 The miracle came through your book – KANKER: MENGAPA MEREKA TETAP HIDUP. Suddenly inside me, I said: Do not go for radiation, I need herbal. Yes, my wife and I felt very peaceful after taking this decision not to go for radiation. So we went to Penang. One of my doctors in Jakarta had previously told me that I should undergo radiotherapy. Later he met with his friend, a professor from Holland who reviewed my case and restudied my cancer slide. He then sent my slide to his professor friend who is an expert in my cancer type. The conclusion is that my cancer NEEDS NO further treatment. If I were to undergo radiation, my condition will become worse, and the cancer could become more malignant. In my mind I imagined that if I were to undergo radiation as recommended by the doctors, I would be already dead. This is indeed a true “MIRACLE”. While I consume your herbal, I went to see Doctor Nephrology, who had previously informed me that my cancer had already spread to the liver or kidney. This was because the laboratory test showed blood in my urine. This time Dr. Nephrology checked me again and told me that my liver and kidney were clean. The pains and the swollen ankles might be due to rheumatism. At that time I could barely walk and my ankles were very, very painful. There were pains in every position. I went to see Doctor Rheumatism. From my laboratory report he said my autoimmune was very high and this attacked my ankles and the wound. So my shoulder was like carrying a 50 kg weight. My neck was very tight and I could not turn to the right or left. Doctor Rheumatism said that my autoimmune should be suppressed. But if we do that then the cancer would be made stronger. I informed him that I am consuming the herbals for controlling the cancer. Doctor Rheumatism agreed to infusion medication to suppress my autoimmune. The result was very good. My shoulder got better, lighter and my ankles also felt lighter but there were still pains. However, the swelling was gone and I could walk again. Two weeks after the first infusion, I went for a second infusion. My body was getting better again. The laboratory report also showed better results and my ankles were almost normal with no more pain. I am still consuming the herbs: Capsule A, Oral 1 and Oral 2 teas, beside fruit and vegetable juices. My condition is very good. The laboratory test, scan and USG are all very good – clear of cancer. Thanks GOD, JESUS CHRIST, my savior. And thank you also to Prof. Chris who wrote many books on cancer and give help to people. Thanks for your attention, and hope my experience could help other people too. Question: When you came, your neck muscle was very tight and painful. You said it was like 50 kg weight on your shoulder – how are you now? Is the weight lighter? HB: Now already normal, only around the wound I still feel sensitive. Q: Do you still have the same level or pain – or it is better? HB: Now no more pain, already normal. Q: You cannot exercise because your hand cannot stretch – how is it now? HB: I can do a bit of exercise, and every morning I do this as much as I can. Q: You said you cannot turn when you sleep – how is it now? HB: Now I am already normal. Q: You legs were swollen and painful and you had difficulty walking – how is it now? HB: Now already normal. I can already play badminton, running, carry some goods, driving car, etc. Q: Tell me, do the herbs help you or not? HB: The herbs are very helpful. Q: You were taking juices, etc., from the nutritionist – do you still continue this? You still pantang(avoid certain food) like we told you? HB: Yes, I still continue all these until now. I still pantang, but not so strict like previously after the operation. Before the operation I was 72 kg in weight, then it reduced 53 kg and now I am 60 kg. HB’s first visit to our centre in Penang was on 6 February 2009. Below is our video recording of his visit that day. In the foreword for the book: Prayer, faith and healing by Kenneth Caine and Brian Kaufman, Dr. Bernie Siegel wrote: Though prayer and faith are generally not a part of any medical school curriculum, I have clearly seen the healing role that they have played in my life and, as a physician, in those of my patients. Not many doctors are like Dr. Siegel who would interpret life’s events in a spiritual way. More often, in this materialistic world, we only see OURSELVES as the creator of our own success. The hand of God is often never acknowledged. A psychiatrist, Dr. Frederic Flach (in: Faith, healing and miracles) wrote: I’m not sure we really appreciate how much we have received or where these wonders have come from. Consistent with the materialism of our age, we take credit for having made these amazing advances all on our own, and fail to see them as God’s providence and continuing revelation about the nature of our world, to say nothing of his mercy and compassion. After my talk at the Indonesian Food and Drug Administration many years ago, a lady who was one of those listening to my talk, walked up to me and said: I am surprised that as a scientist, you brought up the subject of God in your presentation. I was surprised too by her comment and replied: I make no apology about that because in healing I experienced God’s healing hands. I am not ashamed to acknowledge that it is only “our hands but God who heals”. No doubt about that, in science and medicine, God has no place and plays no role. You make yourself a fool among the scientific community, if you champion such a cause! A great psychologist, Freud, considered all religious faith to be a form of mass delusion. Albert Einstein, the greatest scientist of the 20th century, did not believe in God, though he acknowledged the existence of a Supreme Order. I wonder where then is the difference? 1. The doctors have done a miraculously job of removing the tumour and his infected lymph nodes. Doctors are smart and skillful. Credit to the doctors! Blessing from God? Depends. 2. Almost all the doctors that HB consulted were very sure that he must undergo radiotherapy. HB was in a dilemma. He said a simple prayer: Lord Jesus: Do I really need this radiation or not. At CA Care we encourage patients to seek comfort through Spirituality. We tell patients to go home and pray to your “God”. We know that by doing this you would be able to find peace within you and to heal yourself. Dr. Bernie Siegel (reference mentioned above) said: When you run into a situation that you do not know how to handle, you will no longer be at a loss as to what to do. You will pray and when you do, you will give God a home and roots with which to grow and reside on Earth and make His presence conscious. Dr. Frederic Flach (in: Faith, healing and miracles) wrote: By surrendering ourselves to God’s will, faith frees us of the futile need to control the uncontrollable forces that act upon us in our lives … faith can ease our way and counteract the destructive physical and psychological effects that any state of prolonged helplessness is likely to induce. Can you see how prayer had helped HB in facing his cancer? With faith his confidence grew and he felt in control. Is this not a miracle in itself? It is said that God will answer every prayer but it need not be in a way that you wish it to be. In human language it may mean “no, wait or yes”. In HB’s case, the answer came in the form of a finding a book in the bookstore. HB knew this. He said: The miracle came through your book – KANKER: MENGAPA MEREKA TETAP HIDUP. Suddenly inside me, I said: Do not go for radiation, I need herbal. Yes, my wife and I felt very peaceful after taking this decision NOT to go for radiation. Of course for some people, undergoing radiotherapy or chemotherapy is considered a miracle for them but to HB, he believed that if he were to undergo radiotherapy, he would not have been alive today, or for that matter, may not be what he is today. Is this not a great miracle that happened? HB was led to do what his heart wanted to do and he found peace and confidence to move forward. While on this point, I am reminded of two patients. This young lady was a nurse and she had breast cancer. Her boss, who is a doctor, gave her the book: Cancer Yet They Live, and said: If you believe in what this book says, go and see him. No, the nurse did not believe in herbs and she went for radiotherapy, hormones and chemotherapy after her surgery. She did not find her cure. Later she turned to us but it was too late. Her abdomen was swollen and the cancer had spread to her liver and bones, etc. She died about two weeks after seeing us. Then there was Jee Sun from Johore. After his kidney surgery, a friend gave him the book: Cancer Yet They Live and the giver said similar words:This is something which can help you. Read this book and then call Dr. Chris. This incident happened in 1997 and today Jee Sun is still living a healthy life. The nurse versus Jee Sun – do you see any miracle there? 3. I also see a third miracle. After HB and his wife came to see us, he went home but he did not sit under a coconut tree waiting for God to do something. He explored further and met Dr. Rheumatism who told him about his high autoimmune problem. 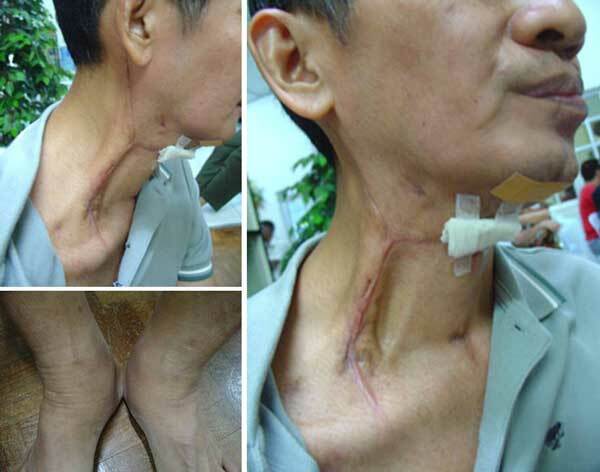 He received two infusions and the so-called 50 kg weight on his neck, swelling, etc., all disappeared. His health recovered to the extent that he can now play badminton. Cancer patients go to the oncologists and radiologists – that is what almost 99.9 percent of cancer patients would do. But HB went to Dr. Rheumatism. This is the first time that I hear such thing. What made HB follow that path? Who was whispering into his heart? I believe it was the Divine and I see the miracle in His guidance. 4. You may wish to ask me why I did not say that God had miraculously cured HB? Let me be plain and clear. I do not wish to make use of God’s name in vain and for propaganda purposes to serve my own ends. A cure, to our understanding, means the cancer will disappear totally and not come back again. Therefore, it is not possible for any human being to say that HB is cured of his cancer. Doctors tell patients that they are cured of cancer if they can survive five years. That is wrong – a spin, only good for business but not based on scientific fact. I know of a lady who had a mastectomy, radiotherapy and chemotherapy for her breast cancer. Nine years later the cancer recurred in her brain. She had radiotherapy and died while undergoing the treatment. So, where is the cure? My auntie had cervical cancer. She underwent medical treatment. The cancer came back and attacked her lungs thirteen years later and she died. Again where is the cure? Scientific data show that patients have to live for twenty-five years to be able to say that they are cured of cancer. Take note – 25 years not five years! Based on this, it would be foolish of me to say that HB is miraculously cured. While on this, let me relate an evening gathering I went to some years ago. There was this lady who walked up the stage and declared to the many hundreds of people listening to her that God had cured her nose cancer (NPC). Then she went on to say that about nine months earlier she was diagnosed with NPC and had undergone radiotherapy. A follow up with her oncologist confirmed that there was not more cancer after the radiation. Bravo, it was a miracle. God had cured her. That evening I felt real sorry. Any educated mind knows that after medical treatment, whether chemotherapy or radiotherapy, the tumour will shrink or even disappear. But this does not mean the cancer is cured. Basic cancer biology tells us that there are still thousands, if not billions, of dormant cancerous cells still floating in the blood stream that cannot be seen even under the microscope, let alone the human eyes or CT scan. So how could anyone ever claim a cure? It does not fit into the scientific thinking at all. Not long ago, I received an email from a patient who said that she took our herbs and then went for surgery to remove the tumour in her colon. A follow checkup showed that her CEA had gone down tremendously. She wrote to thank me and said that the herbs were very effective and caused the declined of her CEA. Well, people may be flattered by such a remark. It makes good propaganda. But I wrote her and said that it was her surgery that caused the CEA to come down, not the herbs. Patients should know that after surgery, generally the tumour maker declines significantly. So let us not try to claim credit so soon. Lastly, let me highlight what HB wrote: My condition is very good. The laboratory test, scan and USG are all very good – clear of cancer. I asked HB: You were taking juices, etc., do you still continue this? You still pantang like we told you? HB replied: I still “pantang” but not so strict like previously after the operation. To all cancer patients, remember this: the fact that you feel well now does not mean that the cancer is gone. The scans may show no cancer, your doctors may say you are in the clear but believe me, you are still not out of the woods. So, to read that I still “pantang” but not so strict like previously after the operation is something sad. No let up please! In my book, Faith and prayer in the healing of cancer, I wrote about Spirituality and how it can help cancer patients. Let us not be mistaken – just because we pray, it does not mean that all our troubles will disappear. C. S. Lewis wrote: If God has granted all the silly prayers I’ve made in my life, where would I be now? Treating religion as a means to an end or manipulating faith for the sole purpose of wanting to get health benefits can bring greater unhappiness or worse health than better health. Meister Eckhart once said: Most people use God like a cow – for the milk and cheese He can produce. Manley Hall said: There is a type of person in whose mind God is always getting mixed with vitamins. In this respect I am very impressed by how HB prayed. It was only a short prayer but was a really great prayer. I too pray everyday and often. But I am a person who does not believe in reciting a long prayer, giving God a long list of chores that He should do for me each day. I believe God already knows my problems. Make no demands. I only ask for guidance and strength to do what is right according to His will. Let God open our eyes so that we can see other possibilities beyond our vision. Let us pray this beautiful American Indian prayer together. The gifts of yours, That can live through me. I’m now active in the Support Group of my church, GKI (Gereja Kristen Indonesia) Kayu Putih. This Supporting Group works with people who has cancer or other’s. Thanks for your email. Regarding your writing of my story, there is no need for you to cover my face. Please use it. Hopefully it (shows) the spirit to our GOD and also the story helps other people. If you need more photo’s we will send you. Today I’m already normal, very healthy. The food is still selective, if possible no meat, no fried, no butter, no sugar, no preservatives, etc. Every day for breakfast we (our family) eat papaya, apple, pineapple and flaxseed. All are blended. Besides I also like to inform you that we have already written my story and it is already published. We will send you some copies and I hope it is useful for supporting other patients. Best regards. HB. 30 July 2012: We received two copies of Jangan Minta Beban Ringan, Mintalah Bahu Kuat – Kesaksian Penderita Kanker. This is an adeptly titled book written by HB himself – Do Not Ask for a Lighter Load, Ask for Strong Shoulders – Testimony of a Cancer Patient. Indeed HB’s message is in accord with our message to all patients. What could have happened if HB were to follow his doctor’s advice and underwent radiotherapy? Would he not suffer short-term and long-term side effects of the radiation? Would he be as healthy as he is today? At the time when he did not know what to do, he found our book and that gave him the Light. What an amazing grace resulting in an amazing healing!